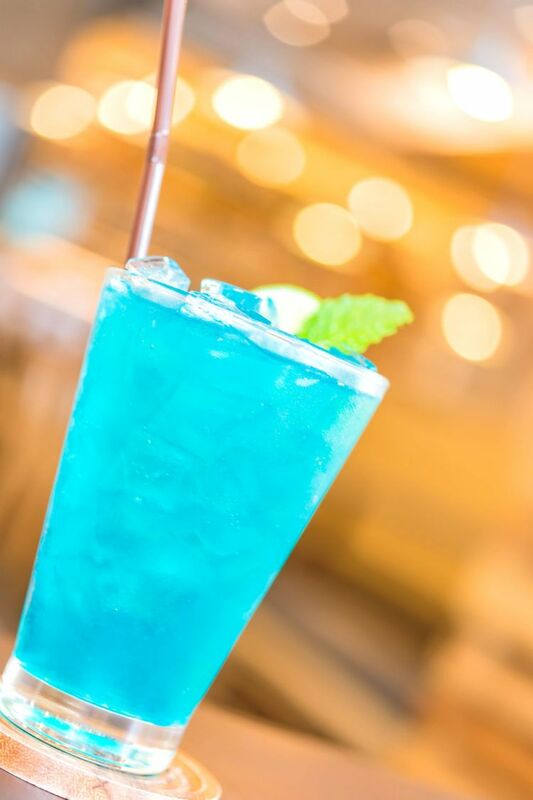 You can just imagine how the Blue Long Island Iced Tea drink recipe came to be. Once upon a time, it must have occurred to someone that the Long Island Iced Tea was nearly perfect. Except for one thing: it wasn’t blue. The Blue Long Island Iced Tea doesn’t have the cola from the Long Island Iced Tea. Instead, it has blue Curaçao. That means instead of cola flavor, you’re getting orange. That makes this a delicious and very refreshing cocktail. It’s all about the orange and lemon flavors. Oh, yes – it has lemon juice, too. Although you can taste that this drink has alcohol in it, the liquors don’t really add much flavor. The rum adds a slight caramel note. The gin adds hints of herbal notes. The agave flavor of the tequila comes through ever so slightly. The vodka doesn’t really add any flavor at all. It’s just there for a little more kick. 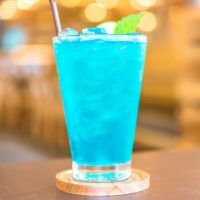 The Blue Long Island cocktail is a very refreshing drink. But it’s also one that can easily knock you off your feet. The alcohol taste is more noticeable than in the normal Long Island. And yet it still manages to sneak up on you. The original recipe for the Blue Long Island called for sweet and sour mix. That used to be a popular item at any bar. Bartenders bought it by the gallon and used it in many different recipes. But so many people have come to hate bottled sour mix. So this version of the recipe replaces it with a mix of lemon juice and simple syrup. The result is a much better, fresher, sharper flavor. Try using a good quality simple syrup like Monin’s Pure Cane Sugar. That way, you avoid high fructose corn syrup and preservatives. And it’s not a lot of extra work. The hardest part is squeezing the lemon. But if you prefer to use sour mix, you certainly can. Some brands are better than others. Or you might also prefer to make your own sour mix. In either of those cases, ignore the last two lines of the Blue Long Island recipe. Replace the lemon juice and simple syrup with about 5 ounces of your sour mix. You might find you actually enjoy making sour mix. It’s a lot of fun to play around with the recipe. Try a blend of lemon and pineapple juice. Or lemon and lime with orange. It just involves buying some fruit and doing some cooking. But it’s really quick and easy to make. Making your own mixers can be surprisingly fun and rewarding. 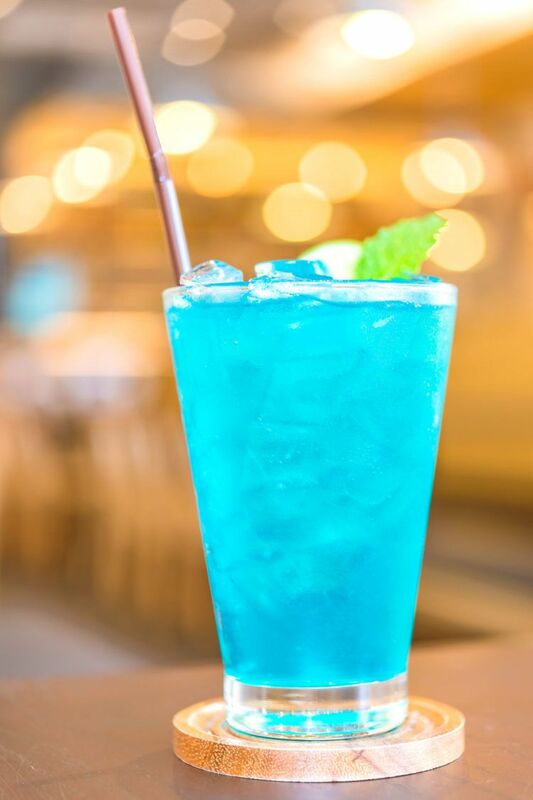 Either way you go, the Blue Long Island Iced Tea is a very tasty drink. And it’s a double. It’s got four ounces of hard liquor. It’s ideal for sipping along. And in fact it can go very well with a meal. This is a great summertime cocktail. It’s refreshing and citrus flavored. And it’s gorgeous to look like. Perfect for sipping by the poolside. But it’s also perfect for days when you just wish it was summer and you’re tired of the heavier flavors of winter. This is definitely a drink to be enjoyed anytime, year round. Try the Blue Long Island with dishes that have a salty-sweet element. For example, this Chicken Teriyaki Recipe from Arbuz. This isn’t the heavily glaze teriyaki chicken that you might be used to. It’s lighter, but it’s still very savory. And it makes a wonderful contrast with the drink’s flavors of orange and lemon. If you like this drink, check out the Blue Skies cocktail. It has similar flavors but is much lighter on the alcohol. It’s got some bubbles, too, which makes it extra refreshing. 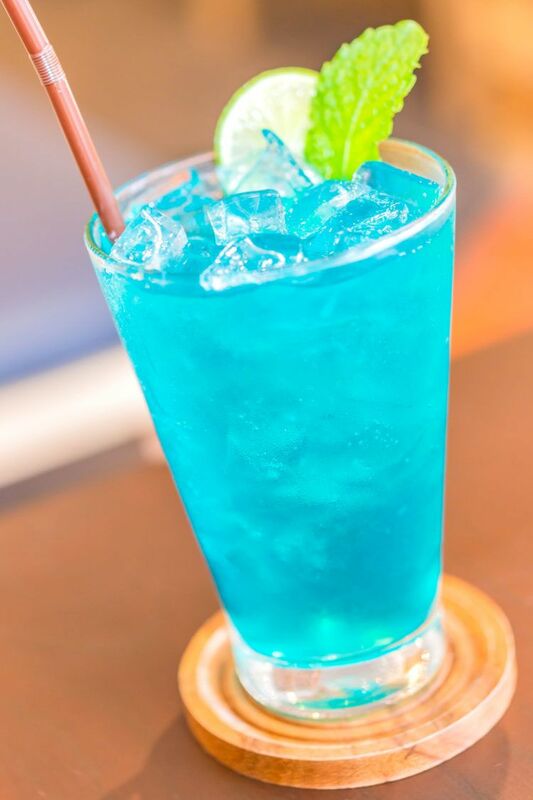 The Blue Monday cocktail is also similar. It falls somewhere in between the two in terms of alcohol strength. It’s simple and easy going. 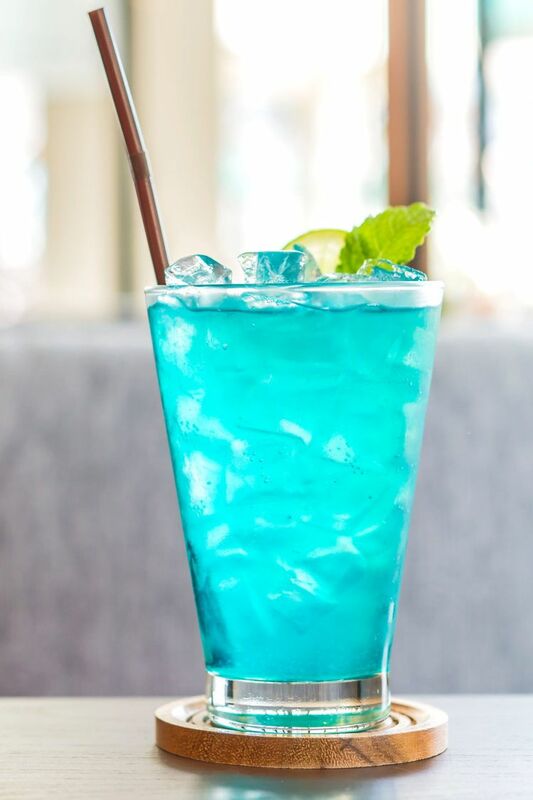 The Blue Long Island is similar to a Long Island Iced Tea, but it features Blue Curacao instead of cola. This gives it a nice orange flavor that's really enjoyable. Pour in the liquors, and then the sour mix. Finally, add the blue curacao. Garnish with a slice of lemon and a straw. And feel free to tinker with the amount of sweet and sour to get it to your taste. I was talking about for color, not flavor. I actually like this better than the Long Island. The orange flavor is nicer than the coke.